Eyes can be one of the most expressive parts of the body. Looking at someone’s eyes can give you hints about their mood, energy and personality. Using an eye definer can help you create the exact mood, energy or personality you want to convey. 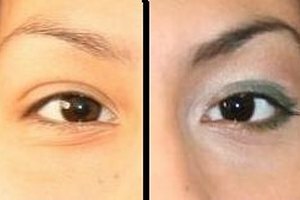 Use the eye definer incorrectly and you can make your eyes look small, tired and uneven. An eye definer brush is a small fine flat brush. Some have a straight edge, others a tapered edge, and some have both. The eye definer brush can be used with wet or dry eyeliners and can be used to create precision lines or for blending. Dip the eye definer brush into the powder or cream eye liner. Tap the brush on the edge of the container to remove excess powder. Hold the tip of the brush parallel to the upper lashes. Rest your pinky or ring finger on your nose to steady your hand. Gently pull the lid taunt from the outer corner to allow for smooth application. Apply the powder or cream eye liner using small even strokes just above the eyelashes. Start from the inner corner of the eye and move towards the outer corner. A tapered edge eye definer brush can help if you have difficulty applying eyeliner to the innermost corner. Strive to draw an even-width line as close to the lash as possible. 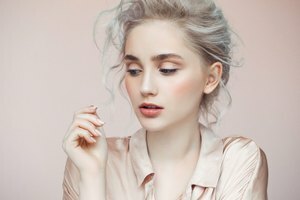 Keep the brush parallel to the eyelash and smudge the cream or powder by pulling the brush in an upward motion angling outwards the closer you get to the outer corner of the eye. Blend the line until there is no discernible edge from one end to the other. Move to the lower lid.Use the inside edge of the iris as your guide of where to start the lower line. Do not start the line at the inner corner as it will make the eye look smaller and unnatural. Line to the outer corner of the eye, but do not touch the upper line. Draw this line using detached strokes. The dashed approach will keep the line more subtle. 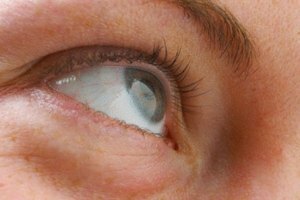 The dashes can get heavier as you move to the outer corner of the eye. Blend the line together using the eye definer brush parallel to the lash blending down and out towards the outer corner. 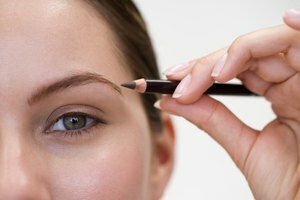 Dip a cotton swab in a little eye-makeup remover for any necessary clean up.